It’s been a super slow week for tips and breaking news, thankfully. So today’s post is a little shorter than normal. And, that’s a good thing for all of us once in a while, we need the breaks, right? I’m very pleased with the way the new theme design and content revamp is going on BlogAid. I’m thinking we’ll likely finish the design on the sandbox site this week. And I’m still plugging away on the content revamp. In fact, the content revamp on most all of my pages on the live site has been completed. They will just need some minor style changes for the new theme. What I’m most pleased about with this change of theme is getting rid of all the complex coding I had in my original theme. It was designed back when it wasn’t easy to do some of the things that are pretty standard in themes now. So, going with a new base will remove all that bloat and extra plugins needed to do it, like ACF, which lets designers create blocks of content areas with more ease. And for the site owner, that translates into lower design costs. And, with all that stuff gone, when I do get ready to transfer over to a fully Gutenberg compliant theme in a year or two, it will be far, far easier to do. Plus, we’re being super careful to remove anything that came as a default with this theme that is going to be a speed drag, like Font Awesome. There are plenty of other ways to call in those special characters that don’t slow down the site. That even includes how I’ll be setting up my social follow and share buttons, the little down arrows in the navigation that have drop-downs, the little red triangle I use for bullet points, and so much more. Designers, Level 4 of my Webmaster Training course that’s all about performance, will change the way you design. We are not sacrificing anything in the way of looks on the new BlogAid design, yet we’re able to make it way faster. With just a little bit of training, you can make more money, and get design projects from savvy site owners who are concerned about speed. That’s the kind of skill that can radically separate you from the dime-a-dozen designers that only know CSS, and have never delved into the tech, or security, or HTTPS, or SEO. They are mostly just delivering pretty to their clients. You can deliver so much more with just a little guidance to help you learn the tech. The new house deal is officially off. Incompetence on the part of the seller’s title company and my mortgage finance folks made sure that we couldn’t meet closing on time. Needless to say, I now have a new mortgage lender who is amazingly professional and could have closed as quick as 8 days, but the seller is now unwilling. In fact, she didn’t really want to sell the house in the first place. It was her parents and family forced her into estate sale. She took all these hiccups to mean that it wasn’t meant to be. Good for her. Bad for me and the 15 other folks involved that all lost money and time. So, now that I’m getting my sanity back I’ll have the ability to focus squarely on my business again. I’m going to take a break for about a month and re-evaluate whether I want to try for a move this fall or wait until next year. So, no unpacking for me just yet. The main reason I need be at my desk without interruption for at least another month is because we’ve got really big site things coming down the pike, like Gutenberg in August. Even though most of us won’t be making use of it, I need to prepare all of us for the release, and start keeping current with what’s new, and when it will become viable to use. Keep in mind that this first release with 5.0 is just the text editor part of Gutenberg. There is way more to come, they just have to get a base chunk of the code into the core so designers and devs can start working with it fully. We’ve got a long way to go with Gutenberg being a fully viable thing to use. Plus, my webmasters are already preparing sessions for the designers in the group, as they have to stay at least 6 months to a year ahead of the demand. So, I have to postpone any new house hunt for now and be at my desk and completely focus on my biz and keeping you ahead of the curve. Plus, I’m making super headway on the waitlist for site audits and HTTPS conversions. In fact, I’m already booking into mid August, because folks want to do this after their kids go back to school. So, you may want to get your request in now. That includes my current site audit clients too. Your site needs a checkup about every 12-18 months. Think of it as a regular oil change and tire rotation. And loyalty audits are faster and cheaper. I just fix and update things as I go. Besides getting my head all up in Gutenberg in the next two weeks, I’m also going to start in on my list of tutorials to update in my member sites. A week or so ago I updated all of the Yoast SEO tutorials in the DIY SEO course that were affected by the new Snippet Editor. There were about 6-8 of them that needed new screenshots and info. I also have two new courses that I’ll be introducing this fall on the basics of Google Search Console and Google Analytics. I want to get a jump start on those, beginning with a course on the new Search Console interface. 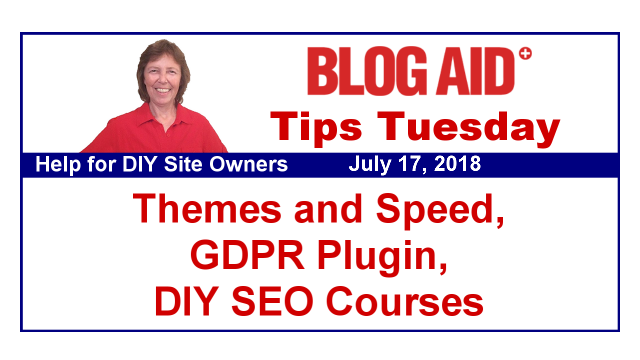 You may recall in previous Tips Tuesdays me mentioning all those emails some of us have been getting from Google about crawl or other issues found. Well, those only show up in the new interface. The new recipe schema markup errors are a good example of that. I hope to get a course on the regular interface complete before Halloween. And the Analytics course will be before the end of the year. All through the rest of the year I’ll be running more SEO Flash Challenges. Our last one on content revamping was fantastic. We learned all kinds of ways to delete old posts and images. So, if you’re in the course and haven’t watched that replay yet, be sure to do so. The link for it is in the boxes at the top of your member dashboard. The next minor release of WordPress will have a Try Gutenberg nag at the top of your admin pages. There will also be enhancements to the new Privacy section that is related to GDPR. I’ll have more info about all that in a dedicated post soon. The beta release is already out and I’ll be checking into it this week. The full release to the public is expected to be on July 31. This is a minor release, meaning that if you still haven’t take full control over your WordPress updates, it will go live for you automatically. Yesterday I heard rumors that both HostGator and Bluehost had been down most of the day. Even heard that Amazon was down for a while. I haven’t been able to substantiate the rumors, but I do know that all of my site audit clients are sure glad they got off those EIG owned hosts!!! The internet is a bit more fragile than folks think too. I know Amazon extended their Prime sales day, and too much traffic can overwhelm internet hubs, even on cloud servers that are distributed all over. So, not for sure what happened, but just know that sometimes these things are outside of a host’s control too. So, now that most of the initial hoohaa has settled down with the GDPR stuff, I’m wondering what conclusions you have come to for your own site with it. I feel comfortable now publicly saying that I decided not to block cookies on my site, but use a notification to say that cookies are in use. And I’m seeing bunches of other really big, and popular sites taking the same action, which gives me a lot of ease about it. And, the consensus among many of my clients and popular bloggers seems to be that the Cookie Consent plugin is getting it done for them. So, I’m checking into that one for BlogAid. Right now I’m using the Icegram plugin I already had for the sticky banner at the top. It allows for 2 banners, so I put the cookie one at the bottom. But in the new theme, Icegram may be going away, so if I’m going to change plugins, I might as well look into the one that I’ve heard so many others land on. You can see a list of the plugins I checked into during that whole GDPR news flash. I have not vetted or tested any of them, and won’t be doing so, as they could change and I don’t want to be liable for keeping that whole post updated at that level. It’s a legal thing. So, use at your own risk, and what you think is right for your site and GDPR needs. I want to thank Denise Wakeman for the heads up on a new place to get awesome free pix for us to use on our blogs and social media. It’s called ReShot and they have some really nice photographs on there. So go give it a look. So sorry to hear your house fell through MaAnna, but sounds like it was meant to be on all fronts. Here I’ve been thinking of you in the middle of moving. Looking forward to your test results on Cookie consent. It’s the one I’m seeing on a lot of sites as well. And, thanks for the shout out! It’s likely I won’t do a blog post on test results for Cookie Consent, or any of the GDPR plugins. It’s too likely things will change with them as GDPR changes continue to be ironed out. And, it’s a legal thing. I don’t want to have to keep that kind of post updated, or imply that folks should use it a certain way. And I really hate that about all this GDPR stuff!!! I wish I could do what I do with all other plugins and freely share my opinions and advice.